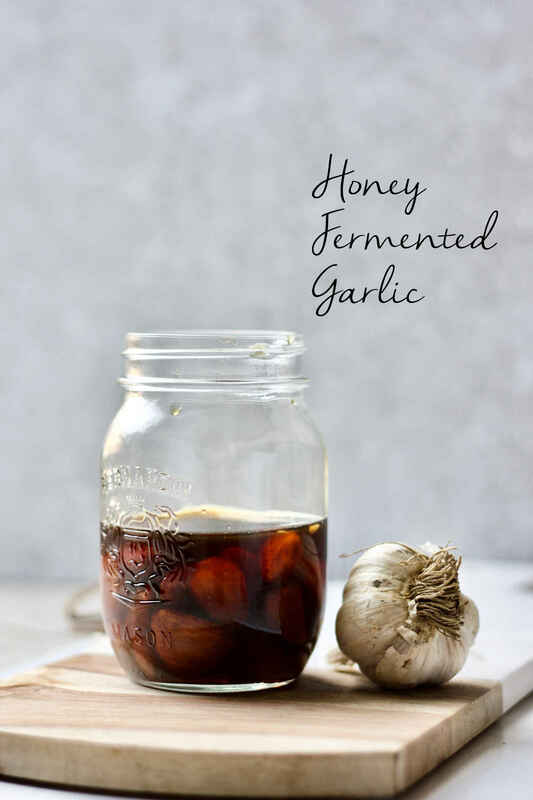 Honey fermented garlic can be used to combat cold and flu in the winter season or simply as a condiment to add a honey garlic flavour to any dish. Honey fermented garlic? Yes, you heard it right! 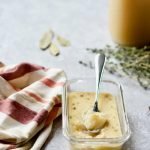 This recipe is long over due: I first learned about the method to ferment garlic and honey together from the WFU Facebook group (at that time I didn’t have this blog yet), I was immediately intrigued and knew that honey fermented garlic deserves to be known by more people out there. Most fermenters call it “fermented honey garlic”, but I think “honey fermented garlic” is more technically precise. It’s just my personal preference for naming, essentially “fermented honey garlic” and “honey fermented garlic” are the same thing. Some call it “honey infused garlic” or “garlic infused honey”, because this recipe works much like an infusion in addition to fermentation. 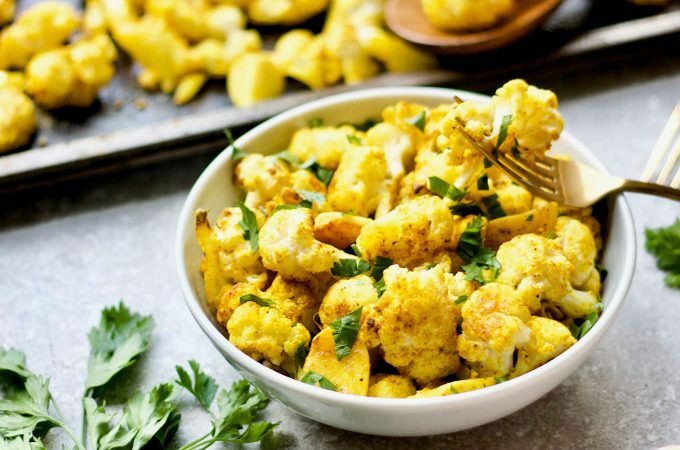 I think these names give you a good idea of what the final product may taste like – both the flavours of honey and garlic will have infused into each other, and you end up with a garlicky honey and sweet mellowed garlics. 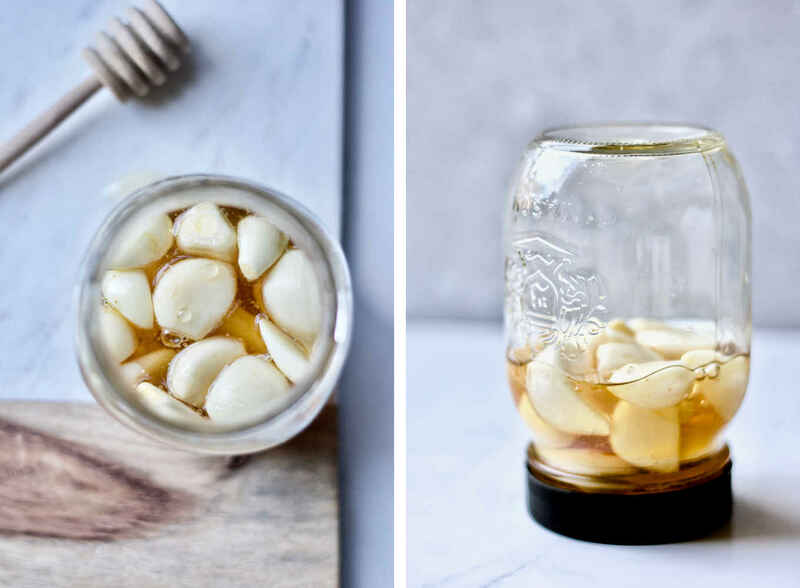 Why should you make honey fermented garlic? I should add here that most people I know of who make honey fermented garlic do so to use it as a cold and flu remedy, based on anecdotal evidence that it works for them. We all know how honey and garlic are powerful antimicrobials against infections in the mouth and throat; honey is also a natural cough suppressant. 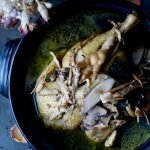 Although I would use honey and garlic fermented or not, it is definitely a lot more palatable to eat a large amount of honey fermented garlic at times you want to pump up your garlic consumption – for example, the first sign of a flu. 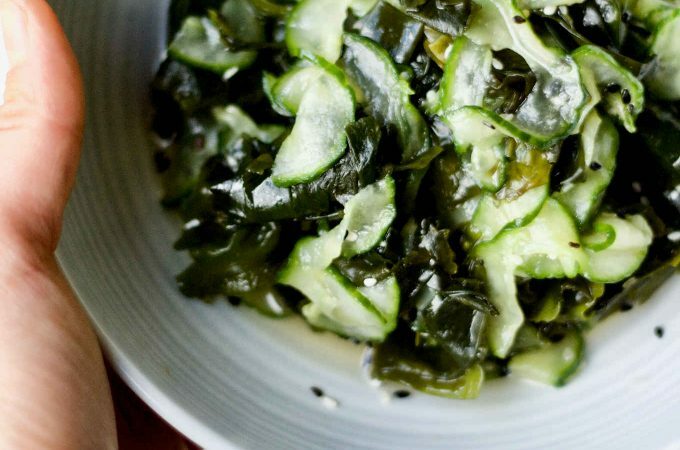 This recipe seems very easy from the ingredient list, but getting it done right requires some understanding of how fermentation works. If anything, this section is the most important of the post, explaining the key points of this fermentation. You want just enough honey to cover the garlic, not too much. The garlic will release moisture into the honey to set stage for fermentation to start. If too much honey is used, the mixture may not reach the moisture content required (18-20%) for the fermentation process to begin. In that case, you may add a couple spoons of water into the mixture when you see no signs of fermentation (bubbles) in a few days. Like other vegetables you ferment, the garlic should be kept under the liquid to prevent mold growth. Since garlic naturally floats on top of the honey, you can stir with a spoon or chopsticks daily or flip the jar upside down a few times a day (as shown in photo above) to ensure that all garlic cloves are coated in honey. This should be continued until your garlic no longer float. Once the fermentation begins in a few days, bubbles will be produced varying from a little to a lot. Sometimes, the bubbling can be so active that it overflows the jar. Therefore, leaving plenty of head space in the jar when fermenting honey and garlic is crucial in saving yourself from ending up a sticky mess. It’s also crucial to open the lid of the jar daily to “burp” the jar by releasing the carbon dioxide. The bubbling will subside over the weeks, and eventually you will not see bubbles produced nor will you need to release carbon dioxide from the jar. As you can see from the photos below, honey fermented garlic changes colour over time. On the left is freshly combined honey and garlic: the garlic cloves float on top of the honey for the first many weeks. On the right is a jar of my honey fermented garlic aged for 1+ year. Over time, the garlic cloves will gradually sink to the bottom of the jar, and the colour of honey will gradually darken. What you can’t see from the photos is the change of the thickness of the honey. The honey will thin out over time due to the moisture released by the garlic. Comparision: Left – combined honey and garlic on day 1. Right – aged 1+ year old honey fermented garlic. Should Botulism be a Concern in Honey Fermented Garlic? What I learned is that in order for botulism to occur, it has to meet a list of right conditions, which I won’t go into too much details about. One of these conditions is the PH level. The average PH level of honey is too acidic for botulinum spore to produce, therefore the concern for botulism is close to none in acidic environment and fermented foods. The actual risk for botulism is much higher in canned or packaged pre-made food items, or non-acidic foods preserved in oil before they had a chance to be fermented to reach the <4.6 PH level. Personally I am comfortably not worrying about botulism in honey fermented garlic, while I am someone who would not use oil topper for vegetable ferments due to the risk of non-acidic foods trapped in the oil layer that may lead to botulism. 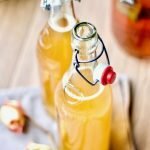 If you are still concerned about honey fermented garlic, I know some add a splash of apple cider vinegar to keep the PH level low. I encourage you to do your own research and decide on your comfort level. p.s. Everything I learned about this topic comes from reading in the WFU Facebook group. I simply summarized what I have learned there with my personal understanding. 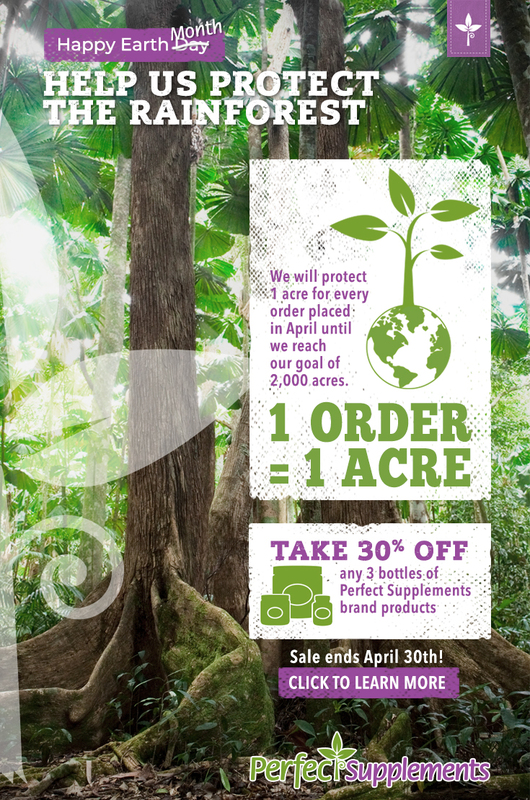 If you are a member of the group, you already know how awesome it is! Combine garlic cloves and just enough liquid raw honey to cover the garlic in a glass jar. The glass jar should be large enough to roughly double the capacity of your ingredients to leave room for expansion. Close the jar with a lid. Stir the mixture or flip the closed jar upside down daily to ensure all garlic cloves are coated with honey. Within a few days, air bubbles should be forming. This is a sign of active fermentation. Open the jar daily to release excess carbon dioxide. If fermentation doesn't begin, then add a spoon or 2 of water into the mixture. Repeat step 2. Continue the process until fermentation slows down, the honey thins out, the bubbling stops, and the garlic cloves sink to the bottom of the jar. It may take over a month. At this point, you can store the honey fermented garlic in a sealed jar, unrefrigerated, to let it age. For best taste, the honey fermented garlic can be consumed after 3 months. The finished products can be stored in a dark place in room temperature for years. If you prefer more honey than garlic in your finished product, you may use more honey than indicated in the recipe as you wish. Just note that you will more likely to need to add some water in order to start the process of fermentation. See "fermentation tips and trouble-shooting" section for more details. I started a batch a little over a week ago, but a couple of days later I turned the containter upside down to cover all the cloves and forgot to turn it back right side up. When I arrived home later that day, a lot of honey spilled from the container. I tried to fix the batch by adding more honey, but I’m not sure if it’s still fermenting. The honey seems a lot more liquidy than before, but it’s not really bubbling and the garlic is still floating. I’ll leave it as it is for a little longer, but I was wondering, are there any other ways I can tell if the process is still happening? You mentioned it’s most effective after 3 months. I’m so impatient! Wanting to help my littles with cold and allergy issues. They already eat minced garlic in a spoon of honey, so hoping they will tolerate this even better! Do I have to wait the 3 months or will it be fermented and beneficial (more than unfermenetsd honey and garlic already are) any sooner? Please see instruction #5: “For best taste, the honey fermented garlic can be consumed after 3 months.” I don’t think we have the scientific data on when it’s most effective. If you don’t have issues with how pungent raw garlics are, you don’t have to wait that long for the flavour to infuse. Hi, i tried to make one batch, and just after one day i saw mold start forming on the garlic. Should i worry about it? Is it possible to salvage it? *Sorry didn’t mean to double post. But i accidentally reply on other comment, instead of new comment. So sorry about it. Oh no, I am so sorry to hear that! This is a tough case too. Both garlic and honey are so expensive! Well, if it’s only 1 garlic affected, maybe I will threw that one away and the honey around it, just because the materials aren’t cheap. If more serious, I will have to let the whole jar go. Mould isn’t good and worth taking the risks for in general. Well, I am wondering how did that happen? It usually takes more than a day for mould to develop. In this case, maybe the mould was already starting to form on the garlic before going into the jar? Also flipping the jar to ensure garlics are fulled covered in honey and not exposed to air is to prevent being affected by mould. myabe, i think i need to start a new batch, luckily i only used only a small amount of honey and garlic to start. thanks. If you wanted to add the apple cider vinegar at what point would you add it just to be safe. Before or after ofermentation. Thank you. You will add it before the fermentation. Hello, I started a batch about a month ago and I opened a jar to try it and tasted metallic? It’s that normal? I asked on a different forum and one person said it was because of using metal lids and that I needed to throw all the batches away. (I used a Kerr glass jars with the lids they come with) Do you know if that’s true? Or what’s going? If you used a metal lid and the lid was in contact with the contents, it’s possible the metal reacted to the fermentation and changed the taste of your contents. Only you can decide whether you are comfortable consuming the products, given that it now taste metallic to you. I used the Kerr lids the bottom looks like it’s coated though, unless it’s from the rings somehow? Which kind of lids do you use? Sorry about the late response. This is a tough one, I really don’t know about Kerr lids. You can see from one of my photos, I saved a plastic lid from the nut butter jar to reuse for fermenting my garlics. I really don’t like using plastic in general, but in the case of making contact with fermenting garlic and honey, it’s probably better to go with a plastic lid than a metal. Hello, started this about a week ago; had some bubbling (and even some honey dripping through the sealed lid!) 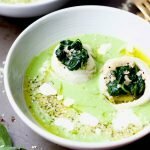 – it looks like the garlic is shrinking, is this possible? Alsoi, the bubbling seems to have stopped. Any advice or does this all sound normal? Everything you described sound normal. The garlics will release some moisture into the honey, and fermenting / bubbling will gradually slow down and stop too. Sounds like you have a successful batch on the way, exciting! Help. I’ve made this and have added some vinegar to lower the pH. But my garlic is browning a bit and has a slight smell to it. Only some of the garlic has sank to the bottom (I made a large jar) is this all too far gone and should be tossed? Or am I being too impatient. Like I said it’s a large jar. But it’s been a month or so. Everything you described sounds fine, unless there is something specific you are concerned about. Can you reuse the leftover honey from fermenting to start another batch along with more fresh honey? I’d like to know this, too. I’m assuming if the pH is still high enough? I have never heard of anyone re-using the honey, to be honest. My thoughts are: 1) the garlic infused honey is a finished product we want, I would eat it rather than using it again. 2) the leftover honey is also a lot more watery than pure honey due to the moisture content released from the garlics. Adding more garlic will increase the water content further.. at some point it will start to ferment into wine? But I have never tried, so I don’t know what will happen for sure. Does this help? I made this a few weeks ago and my garlic is still floating. Ive added 2 tbs of water and its still floating. Anything else I can do? I hope I didn’t waste it. Did your honey bubble up? If so, you are doing things right. Adding water won’t make your garlic sink, it only helps to kick start the fermentation process if there isn’t enough moisture in the honey. The garlic will sink over time. I’m using raw unfiltered honey and it’s very thick. Will it still work? Hello I was wondering if I could swap the honey for maple or agave syrup because I am vegan and I don’t eat consume honey. Hi Beyond, please scroll down and you should find a previous discussion on agave and maple syrup. My guess is that you will need to add additional culture to it. I have not done it myself to know if it will work for sure. I plan to use more of the honey than the garlic cloves. Can I continue to add new raw honey as the honey level starts to get low? 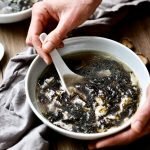 Can you just continue to add more garlic or honey to the original pot as you eat the older garlic? Or should you start another ferment once the previous one has run out? Lauren, I would just start another pot! If you add a small number of garlic to the existing pot, you still have to make sure they are coated in honey by stirring daily, then keep track of which garlic is older vs. newer. Honestly, I think it’s less work and less confusing to start a new ferment. Can you chop the garlic? Yes, you can chop the garlic if you like. 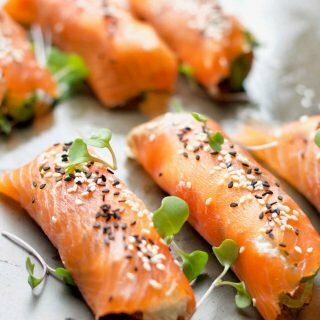 I love this recipe and will give it a try. 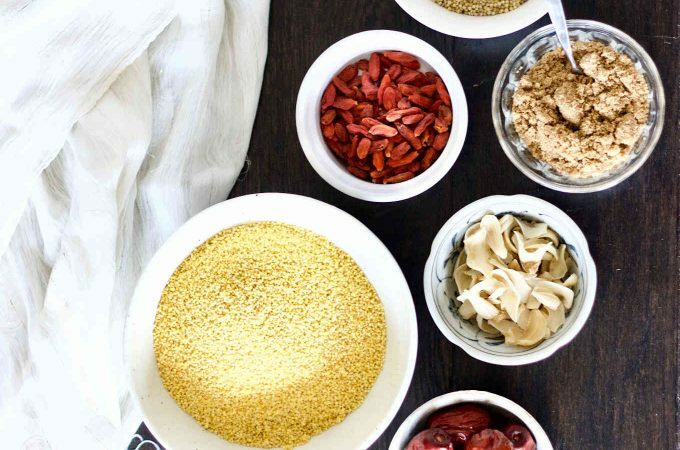 Hopes to see more immune boosting recipes from you. Thanks Yang. 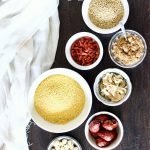 Can I use cactus honey(agave nectar) for this recipe? I made this 2 days ago. It did not start to ferment. . I added 2 TBSP boiled cool water. Will this be okay to consume? Thank you. Carol, if it doesn’t have mould growing and doesn’t smell or look bad, I would say probably ok to consume. Since it didn’t ferment, I would check the source of honey to verify it’s unpasteurized. I just made this. Is it ok to put a weight on it to keep the garlic submerged, or will it cause it to ooze everywhere? It really depends on how much space you have above the garlic. If there is plenty of room, then yes, put on a weight will be fine. Keep in mind that your garlic ferment will bubble with or without the weight on, so leaving space above is key. My reservations about using weight is the work of cleaning afterwards and possibly wasting some honey. Your photos don’t seem to indicate expansion of the final product and I already filled my jar. If I burp it often, is there any chance it will be OK? As we know fermentation is such a natural process that depends on factors in your own home. Some people’s honey garlic ferment doesn’t bubble as much as others, so yes you may have a chance it will be ok. However, if it does bubble over, you will have a big mess to clean up and waste a lot of the expensive honey. If I were you, I would take another glass jar and pour half of the content over, it takes 1 minute to do. Should the jar be kept in a warm or cool location? Hi Suzanne, there is no particular requirements. Within the normal range of room temperature should be ok. I wouldn’t look for an extra cold or warm spot in the house. My indoor temperature is usually somewhere between 20 and 25 degrees. With that said above, this is a yeast ferment and yeast ferment works fine in the 20+ degrees, and will get even more active in the high 20s. Hi David, please note that what I say are based on personal experience. I do think the honey has healing properties. Many people use honey for flu type illness, and honey is a commonly used cough suppressant. The infused honey, especially my aged ones, do taste quite garlicky. Of course, common sense tells us you get more benefits of the garlic from eating the garlic, less from the infused honey portion. My little kids would not eat the garlic at all, but I do give them the garlic-flavoured honey when they have a cough, so that they get some benefits of the garlic as well. Make sure you use a good quality raw honey. Hope this helps! After the garlic is aged and you begin using it, do you need to refrigerate the jar? Or does it keep at room temperature after being opened? Thanks! Hi Lisa! 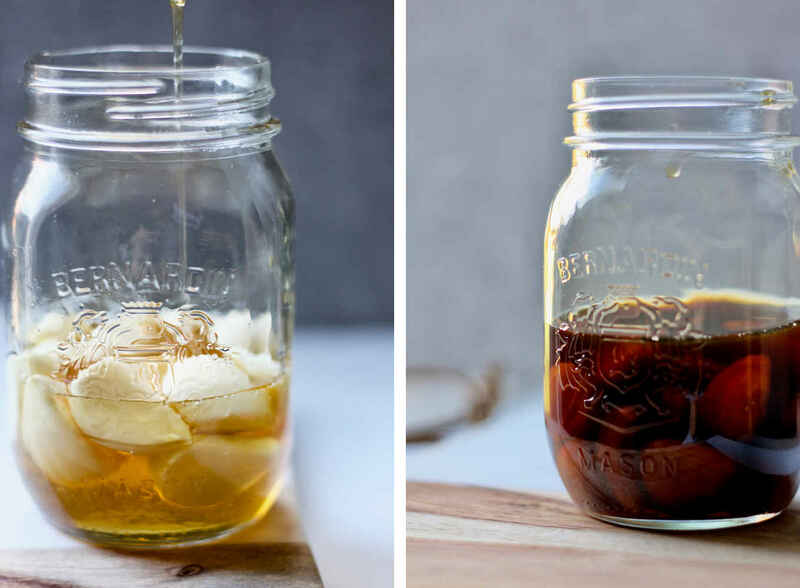 No, you don’t need to refrigerate the jar after you start consuming. It’s stored in room temperature all the way whether you have started eating them or not. Technically they have already been opened, because you have to let out carbon dioxide regularly while you are fermenting it during the early stage. Kim, absolutely! 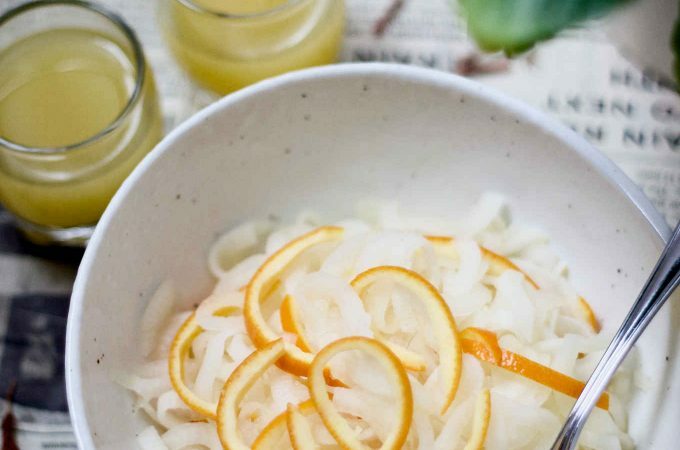 You can even ferment fruits in honey too. I love this idea. Thanks for sharing your creativity. We love using garlic at the first sign of illness! It’s so effective! 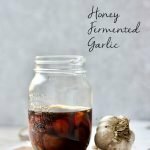 I’ve always wanted to make honey fermented garlic! 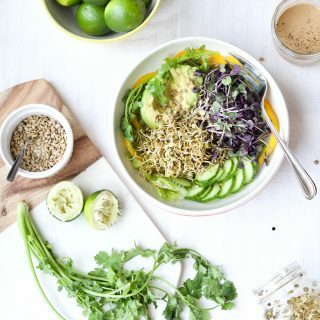 I love simple homemade recipes like this that are great for boosting the immune system! Thanks for sharing Yang! I love what you said about the flavors infusing into each other, and the garlic mellowing. So yummy and healing! Thank you. This is such a cool idea, I’ve never heard of it before (and I’m keen to check out that Facebook group!). Would love to try a honey based ferment! I made some ferments garlic once and never used it because I had no idea what to do with it. Haha. Glad to see it last for a few years, I’m going to go dig it out of my cupboard and take some! Isn’t it cool we can keep fermented garlic for so long? Now it would be the perfect time to use them. I have never heard of such a genius idea!! Will definitely give this a try! What a great idea! This is a good one to keep around for the cold season. Amazing! I have never heard of this before. But will be trying! Super cool! I’m going to make some! Thanks! Oh my goodness this is so awesome! Such a wonderful natural remedy to have on hand to boost the immune system. Love this!!! Thank you Emily! They so come in handy, especially with little kids around. It’s one of those natural remedies that taste good enough the kids are actually willing to take.